Did you know that 50% of 9th-12th grades own a personal smartphone and 21% have personal tablets? Mobile technology enables new and customized learning and today’s K-12 students and parents are looking to these tech tools to personalize education in and out of school. Further, many schools and districts are seeing more educational value from mobile devices, as well as potential cost savings through BYOD plans. In this new report, “Learning in the 21st Century: Mobile Devices + Social Media = Personalized Learning,” we focus on insights on how to leveraging mobile learning to increase student engagement and teacher productivity. 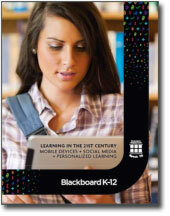 Since 2007, Project Tomorrow has partnered with Blackboard Inc. to create a series of annual reports that focus on key trends in the use of technology to increase student achievement, teacher productivity and parental engagement. Since our last focused report on mobile learning in 2009, the environment for mobile learning has matured with greater clarity around the key opportunities and challenges associated with student use of mobile devices within instruction. In the past three years, teachers’ access to a smartphone has more than doubled from 20 percent in 2008 to 54 percent in 2011. District office administrators are almost twice as likely now to be carrying a tablet computer (55 percent) than a simple cellphone that does not have Internet access (31 percent). And administrators’ interest in using a smartphone or a tablet computer is not dependent upon their years of experience. Administrators with 1 to 3 years of experience only slightly more likely to use a smartphone or tablet than their peers with 16. 87 percent of parents say that the effective implementation of technology within instruction is important to their child’s success (50 percent label it as “extremely important”). But only 64 percent say that their child’s school is doing a good job of using technology to enhance student achievement (and only 12 percent strongly agree with that statement).